The best part of the trip was cooking with my mom. 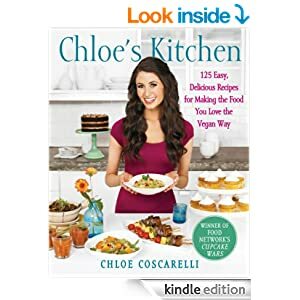 I had gotten a bunch of new vegan cookbooks from the library (by the way, I LOVE LOVE LOVE having a library within walking distance) so we selected a few items from Chloe’s Kitchen. I have been pleasantly surprised with the vast array of dishes in this book, as well as the quality of the recipes. So often vegan recipes are completely lack-luster but Chloe’s really knocks it out of the park. We had the Mandarin Peanut-Crunch Salad (without the wontons), Moo Shu Vegetables (using Shiitake mushrooms and without the Chinese Pancake), and Wonton (but not the sauce). For lunch the next day we made Bahn Mi and sauteed shishito peppers. If you have never had these peppers, do whatever you can to find them and eat them IMMEDIATELY. They are all sorts of amazing. The peppers look scary and spicy but they’re not. They’re incredible. Saute them with a bit of olive oil and salt until the skin blisters. Then eat. Simple as that.The flavors of the peppers are so full that they don’t need much else. We found the peppers at a local Japanese market I discovered. You can find great ingredients (and organic produce) for much less money than a regular store when you spend some time at the Asian markets. I was shocked to find silken tofu at the Japanese market for 89 cents compared to $2-$3 at other stores. WOW! Almost all the produce was organic, too. I wanted to get a few pictures of mom and I in the kitchen together, but the guys were busy playing card games and I didn’t want to interrupt for a photo-op. So, you’ll just have to imagine mom and I laughing together as we worked around each other in my tiny kitchen. I think we did pretty well and had no accidents! I love cooking with my mom, I have been in the kitchen with her my whole life and she’s the reason I know how to cook at all! She’s also the reason I don’t measure anything when I cook. If it looks right, it’ll be fine.